Whether you are driving to the port or flying into the area, you need to get to the cruise terminal before you can start your vacation! Below we have provided directions to Port Everglades and your options for reaching the port by car or other transportation. Despite the name, Port Everglades is actually located in Fort Lauderdale, right on the Atlantic coast. The cruise terminal is just about three miles from the Fort Lauderdale/Hollywoord International Airport and about 25 miles north of the Miami International Airport. The port’s official address is 1850 Eller Drive, Fort Lauderdale, FL 33316 if you wish to map your route using GPS. However, if you are sailing out of terminals 1, 2, or 4 (which are located on the north side of the port, we recommend coming down Eisenhower boulevard from 17th street. If you are driving to the port, click here for parking information. Given the short distance, it’s ridiculously easy to transport back and forth from the Fort Lauderdale airport to Port Everglades. You can use Uber or Lyft to get to the port easily. Rates will actually be a little lower than a taxi, and most people prefer to use these rideshare services due to their lower cost and higher convenience. If you are unfamiliar with companies like Uber and Lyft, here’s how they work. First, you download the app to your smartphone, setting up an account and payment information. When you are ready for a ride, you simply open the app and select where you want to go. A nearby driver will confirm your pick up and arrive shortly. After the ride, you’ll rate the driver through the app and also confirm payment through your credit card. No money changes hands, it’s all through the phone app. Rates for Uber/Lyft from the Fort Lauderdale airport to Port Everglades are about $10. If catching a cab, the ride is short (only about three miles or 10 minutes). Fares will run you about $10-15. Remember that the fare is per car, not per person. Split the fare between four passengers and you pay only a few bucks each for a ride directly to the port. Given the ease of a taxi and Uber/Lyft from the Fort Lauderdale airport, we won’t suggest alternate ways to get there. However, if you are traveling from Miami to Fort Lauderdale, the following options may meet your needs. You can also use Uber or Lyft to get from Miami to Port Everglades easily. Rates are significantly cheaper than using a taxi. For example, Lyft estimates a ride from the Miami airport to Port Everglades would be just $35 one-way for up to four people. That’s less than half the rate of a taxi cab, making rideshare services like Uber and Lyft our preferred method of reaching the port. For our purposes, we’re assuming that you are flying into the Miami airport for a Port Everglades cruise. Miami-based cabs are an estimated $75 from the airport to Port Everglades. That seems expensive, but remember that is the fee for the entire car. Most shuttles, on the other hand, charge per person, which makes them more expensive for an entire group. Carnival, for example, offers a shuttle from the Miami airport to your cruise for $62 round trip per person. Cruise line transfers offer convenience, but we also find they can be expensive and restrictive. For instance, many are only available on the day you cruise and the day you depart. So if you’re flying in the day before, then a transfer from the cruise line won’t work. As well, prices are per person. A family of four taking the Carnival transfer from the Miami airport to Port Everglades round-trip would pay $248! In addition to the cruise line shuttles, there are independent shuttles that can get you to and from Port Everglades and the Miami airport. They are much cheaper than the cruise line transfers, but if traveling with more than one person, a rideshare still comes out on top. SuperShuttle — the big blue vans you always see around airports — offers everything from its traditional shared van service up to private sedan service. If you’re looking for a cheaper ride, we suggest using the shared van service. Rates from the Miami airport to Port Everglades are about $40 for the first passenger and about $15 per person for each additional passenger — or about $60 for a couple. Note that these rates are for a round trip. There are also a number of other shuttle providers that can get you from Miami to Port Everglades (or from nearly any city in Florida). All of the following can give you a good start for your search. The shuttle services can make sense if you are traveling with a large group. If you are staying at a hotel in the area, give them a call and see if they offer a shuttle to the port. 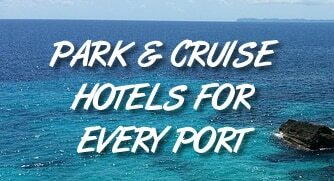 Many hotels in the area cater to cruisers and offer shuttle transportation as a perk. It’s easy to go in style in south Florida. There are plenty of companies that will pick you up in a private car or limo. In fact, many of the same companies that provide shared shuttle service also have private car service too. Of course, this service is typically a little pricier. However, if splitting the cost about four or more passengers, it can be surprisingly affordable. When staying at a nearby precruise hotel on 17th terminals 1,2 and 4 are within walking distance however you CANNOT easily walk into terminal 4 due to the security fence and check point. It’s doable but not advised with luggage. Might be ok for B2B shore walk though.